Teamwork just got a whole lot easier! With Nimble, you and your team can close more deals faster by effectively tracking business opportunities across multiple pipelines or lists. Use the Deals feature to manage sales opportunities, marketing projects, regular projects, renewals, and more. 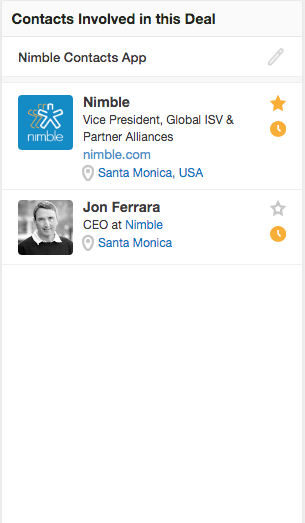 Q: Does Nimble support multiple pipelines? A: Yes, Nimble Business Plan users have the ability to create multiple pipelines at once. You can learn more about creating multiple pipelines here. Q: How do I create a deal? A: To create a deal, select “New Deal” in the top-left hand corner. From there, you can name the deal, relate the deal to multiple contacts and companies, add the valued amount of the deal, schedule an expected close date, project the probability of closing, and choose the beginning stage for your deal. Once your deal has been created, click “Save.” You can always edit an existing deal by selecting the “Edit" option. Q: What displays in a Deal record? A: Nimble will display general information about the deal in the thumbnail of the record, including its stage, name, probability of closing, expected close date, and owner. You can also click “Show All Deal Information” to view additional information such as when the deal was created and by whom. You can enter information for a deal by clicking “Edit”. You can also schedule a task or events, log deal-related activities, make notes, or attach files to your deal. Any updates to your deal will appear in the "Pending & History" tab, along with messages you have with a contact or company related to the deal. Filter these by clicking "Message," "Activities," "Notes" and "Attachments." To the right of the deal thumbnail, you’ll see an overview of contacts involved in your deal. Use the arrow to view a complete list of all contacts involved with the deal. Q: How do I export my Deals? 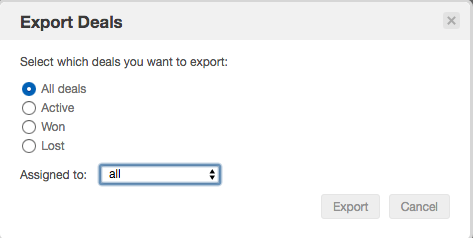 A: To export your deals from Nimble, click “Export To CSV” within your Deals tab. You’ll then be able to choose which deals you would like to export: “All," "Active," "Won," and "Lost." You can also export lists based on deals own be specific team member(s). Q. How do I view Deals on the Pipeline or List view? A. Nimble allows you to view your team member’s deals on a pipeline or as a list. Deals can be moved from one stage to the next by simply dragging and dropping within the pipeline. 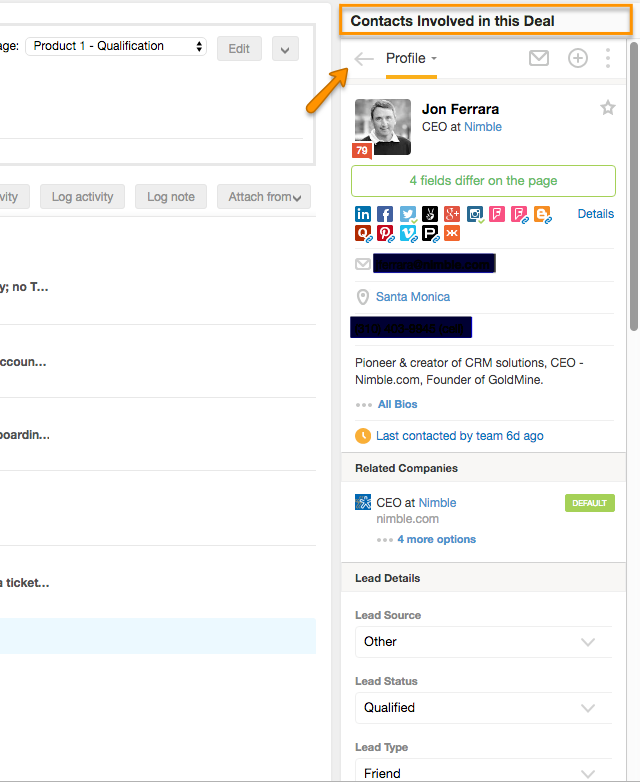 Beside “Deals owned by:” you can decide to view your deals by your entire team or individual team members. Next to this drop down menu, you can view "Active," "Won," "Lost," or "Stuck" deals. A "stuck" deal is a deal that has exceeded the set limit of days with a given stage. It will appear in red. Click “List” to view your deals within a list view. From within a list, deals may be grouped by the following: "Owner," "Amount," "Stage," "Probability," and "Expected Close Date."